With each generation, the precise spatio-temporal unfolding of embryonic development requires a tight orchestration of dynamic changes in chromatin states and corresponding transcriptional programs. Of particular interest is the chromatin state of pluripotent cells that exist in the early mammalian embryo and give rise to all cell types of the body. Moreover, this remarkably broad cell differentiation potential must be transmitted via the germline to the next generation. Pluripotent cells in the early embryo and the germline have a “plastic” chromatin state that is thought to underlie their broad developmental potential. The mechanisms that regulate this plastic chromatin state remain essentially unknown. Research in our lab focuses on deciphering the chromatin-level mechanisms that regulate pluripotency in the early embryo and the germline, and understanding how the environment may impact such mechanisms to modulate development and inheritance (Fig. 1). Figure 1. Avenues of research in our lab. We are interested in the chromatin-level regulation of the pluripotency cycle, from the implementation of pluripotency in the early embryo to the transmission of pluripotency in the germline. While development is generally seen as being genetically hardwired, we aim to understand how the environment, and specifically maternal diet during pregnancy, can modulate epigenetic states in pluripotent cells of the embryo and impact ontogeny and inheritance. a) chromatin decondensation at fertilization. Sperm DNA arrives in the oocyte highly condensed and undergoes rapid incorporation of histones and DNA demethylation, setting the stage for the first division, zygotic genome activation and the appearance of pluripotent cells during pre-implantation development. This remarkable genome-wide reprogramming is thought to be mediated by maternal factors that remain largely unknown. We are studying the maternal regulation of chromatin reprogramming at fertilization and during early pre-implantation mouse development (Lin et al., Development 2013; Lin et al., Developmental Cell 2014) (Fig. 2). b) maintenance of an open state in pluripotent cells at peri-implantation. The open chromatin state of pluripotent cells includes enrichment for active histone marks and globally elevated levels of RNA transcription. The regulation and functional significance of this state remains unclear. Our published (Gaspar-Maia et al., Nature 2009) and recent results (Guzman-Ayala et al., submitted) reveal a critical role for Chd1, a chromatin remodeler associated with transcription, in this setting, both in vivo in mouse embryos and in vitro in embryonic stem cells. Figure 2. Hira-mediated H3.3 incorporation is required for DNA replication and ribosomal RNA transcription in the mouse zygote. Developmental Cell (2014). We also have extensive expertise in human ES and iPS cell research, with a focus on epigenetic somatic cell memory in iPS cells (Ohi et al., Nature Cell Biology 2011) and barriers to reprogramming (Qin et al., Hum Mol Genetics 2012). We recently carried out a genome-wide RNAi screen in human iPS cell generation that reveals novel barriers to human reprogramming and the complex networks in which they interact (Qin et al., Cell 2014) (Fig. 3). We are exploring the role of epigenetic barriers that separate different states of human cell pluripotency. Figure 3. Systematic identification of barriers to human iPS cell generation. Cell (2014). 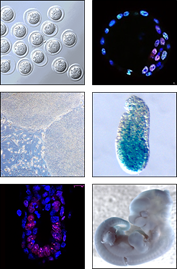 Pluripotent stem cells are cultured and predominantly studied in vitro. However, pluripotency must have evolved for specific functions in the context of the developing embryo, and therefore it is important to investigate the significance of pluripotency in vivo. Primordial Germ Cells (PGCs), the embryonic germline, are fascinating for several reasons: i) they must carry within them the potential to give rise to an entire new organism after fertilization; ii) they undergo a remarkable level of reprogramming of DNA and histone methylation, the function of which remains unclear; iii) environmental impact on epigenetic states in PGCs has the potential to be transgenerationally inherited. However, studies of PGC biology have been hampered by the low numbers of these cells. To overcome this barrier, we improved methods for analyzing global gene expression patterns and chromatin landscape using low numbers of cells. Our analysis reveals that there is a remarkable global maintenance of the transcriptional profile (Qin et al., Hum Mol Genetics 2012) and chromatin landscape (Sachs et al., Cell Reports 2013) associated with pluripotency in the embryonic germline, long after the embryo has began to differentiate all the major tissues (Fig. 4). We are using innovative genetic approaches in the mouse embryo to investigate the role of chromatin regulators in the germline. Figure 4. Bivalent chromatin marks developmental regulatory genes in the mouse embryonic germline in vivo. Cell Reports (2013). Deficiencies in maternal diet or exposure to environmental toxins during development may affect epigenetic states, fertility and disease propensity of the embryo and subsequent generations. However, the mechanisms that underlie the environmental modulation of epigenetic states in the embryo remain unknown. Our recent work (Blaschke et al., Nature 2013) shows that the essential nutrient Vitamin C impacts the transcriptional and epigenetic state of pluripotent stem cells in remarkable ways by acting as a specific co-factor for Tet enzymes and greatly enhancing DNA demethylation (Fig. 5). Interestingly, only a subset of germline genes is de-repressed upon the widespread removal of DNA methylation induced by Vitamin C. We are following-up on these findings to explore the impact of manipulations of maternal diet on epigenetic states in the embryo in vivo. These experiments take advantage of our expertise in the molecular dissection of chromatin states during early development and in the germline to address an often-overlooked factor in ontogeny: the role of the environment in shaping developmental trajectories and phenotypic diversity. Figure 5. Vitamin C induces Tet-dependent DNA demethylation and a blastocyst-like state in ES cells. Nature (2013).